Dallas is hosting the Super Bowl this year, but the Cowboys won’t be on the field. For some reason all the sports pundits pegged them as champions before the 2010 season started, but with a 1-7 start job security is more of an issue. While this may not bode well for ‘America’s Team’, their losses are your win, because toast is part of a complete breakfast. 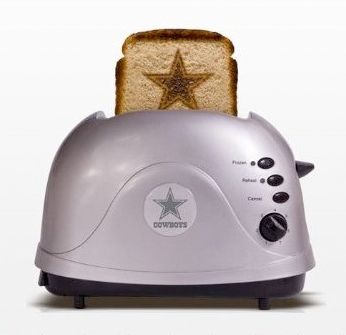 It seems like the rest of the NFL is having the Dallas Cowboys for breakfast, and now with the Pangea Dallas Cowboys Protoast Toaster you can too.